Michael (“Mike”) Ward was a key board member of Integrity Housing until he lost his valiant battle with ALS in December of 2013. Mike had an incessant drive to serve the community. His guidance proved to be invaluable structuring Integrity Housing. Simply mourning the loss of this important member of the Integrity Housing family seemed inadequate and contrary to the optimistic outlook Mike brought to all endeavors. 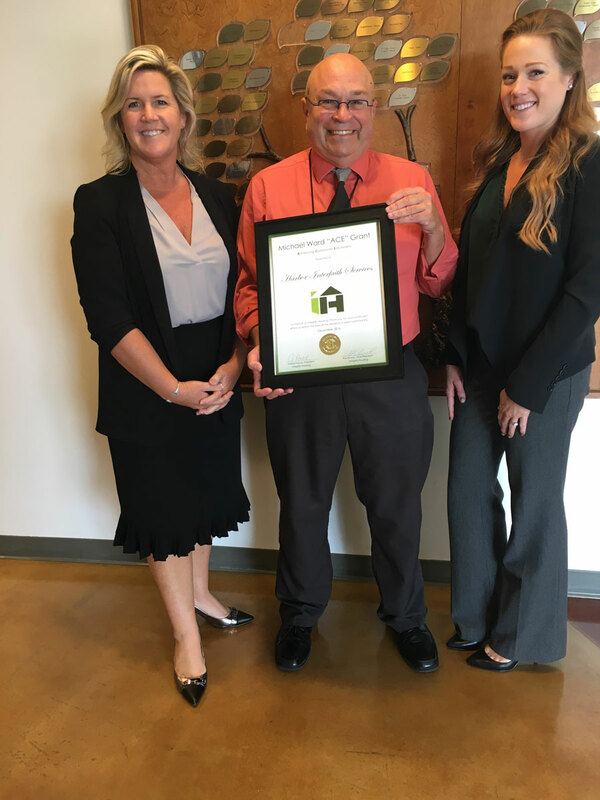 Integrity Housing established a community grant program bearing his name as a fitting and appropriate tribute to his lifelong dedication to the many communities he served. 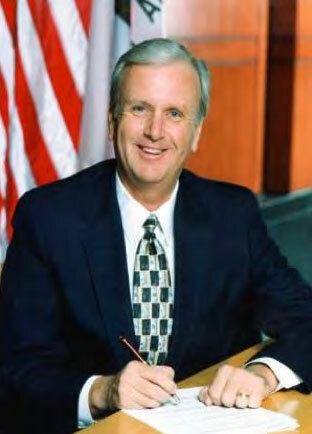 “ACE” is an acronym for Advancing Community Enrichment, which epitomizes the lifetime efforts of the Grant’s namesake. Organizations serving the affordable housing community are qualified to apply for a grant for funding of enrichment programs. These funds are intended to support resident services set-up costs, creation or support of services infrastructure, and staff development for resident services programs. Organizations with a need and feel they qualify under these parameters are encouraged to contact Deanne Cecil of Integrity Housing at (949) 727-3656 or deanne@integrityhousing.org. Each request will be reviewed by the Grant Committee, consisting of Teri Ward, Mike’s wife of 43 years; his daughter Alison Ward and select Integrity Housing Board and staff members. To purchase wireless microphones and the necessary equipment to relay them through the current sound system being used. This funding will further help their mission by allowing students to have access to the necessary equipment needed to perform in a multitude of different productions in music and the arts. The mission of KIPP (Knowledge Is Power Program) Bloom is to ensure their scholars develop the academic and character strengths to thrive in Chicago’s best schools, graduate from the nation’s best colleges, and lead happy, peaceful lives. If you would like to learn more about the KIPP College Prep of Chicago and the services they provide please visit their website at http://www.kipp.org/school/kipp-bloom-college-prep/. Deanne Cecil (left) and Julie MacQuilliam (right) present the Michael Ward “ACE” Grant to Mike Radice of Harbor Interfaith Services. 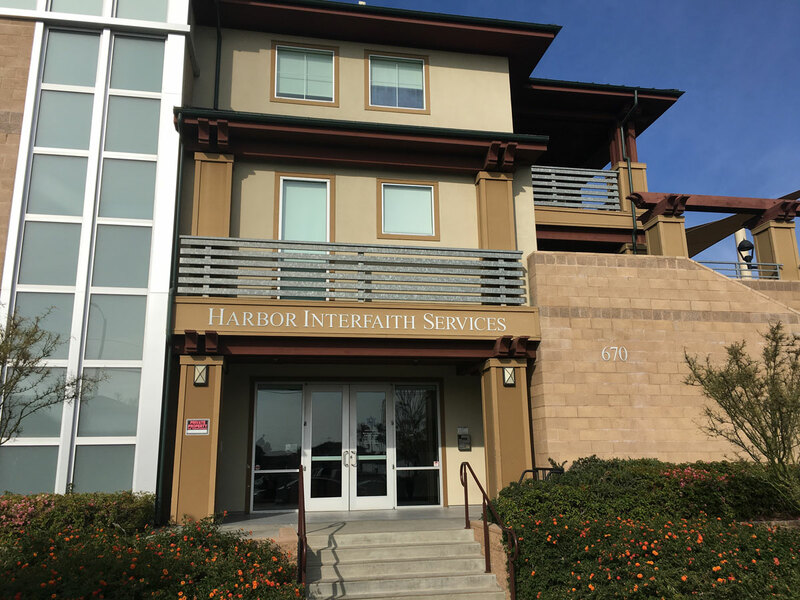 Harbor Interfaith Services was awarded a Michael Ward “ACE” (Advancing Community Enrichment) Grant to provide a wireless network for residents of their ALL Program which serves over 20 families. The new service will provide Internet access to assist the families further their education and ultimately lead to self-sufficiency and independent living. SMILE Preschool toddler enjoys some of the new play equipment provided by the Michael Ward “ACE” Grant award. To aid in the refurbishment and enhancement of its four infant classrooms. 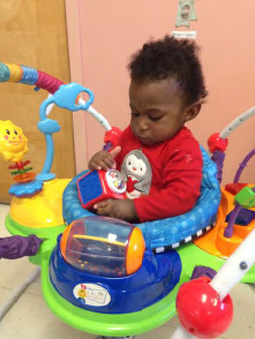 The monies were used to purchase a variety of items, including new high chairs, infant swings, baby bouncers and toys. SMILE (Special Moments In Learning Experiences) was started in 1981 in the Roxbury neighborhood of Boston, Massachusetts by Executive Director Mariam Mahmoud with two children. The mission of the Preschool is “To provide a healthy, safe and nurturing environment with an educational foundation that will prepare our children to be competitive, competent and confident contributing future leaders …” In the area they serve many of the residents live below the Federal Poverty Line and/or Family Self-Sufficiency Line. The children in these neighborhoods are considered “high risk” and vulnerable when compared to the sur-rounding area. Early childhood education has been demonstrated to counteract some of poverty’s effects. Through pursuing their mission SMILE has grown to serve over 130 students ranging in age from six weeks to six years old at two locations. “Children learn through play. Thank you for your contribution to making our learning experience more fun for the babies”, said Caroline Sneed, SMILE infant teacher. 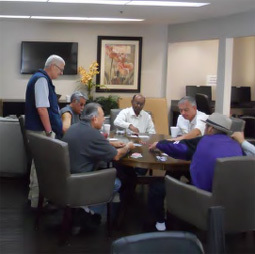 Residents at the Villa Anaheim Senior Apartments enjoying the newly remodeled community room. To refurbish and provide computers and related peripherals to create a first-class computer and media center for its residents. Jim Brown the Resident Manager, related that the residents are very excited about the new amenity which is used throughout the day. At any time there are several residents taking advantage of the computer lab. The entire apartment complex in conjunction with a major renovation is under the management of Western Seniors Housing. It was noted during construction that the computer facilities located in the Clubhouse were in need of updating. The “ACE” Grant award was for the purchase of five desktop personal computers with large flat screen monitors, a common printer, a Wi-Fi router, and associated cabling and installation. The computer facility is an ideal source of mental stimulation. Many residents are using the computers to write letters, keep journals, and send emails to friends and family, keeping them active and engaged. As an added bonus to this addition, the area that was previously dedicated to computer use was upgraded to a media center with a large screen LCD television with a DVD and Blu-ray player. To purchase scales and blood pressure machines to implement their new “Healthy Matters” initiative. The program will engage more than 100 residents per year to participate in weekly exercise classes, healthy cooking and living workshops, and individualized check-ins to monitor health indicators such as weight, body mass index (BMI), and blood pressure. The scales and blood pressure machines were critical to the program because they allow residents to establish a benchmark and measure progress towards meeting goals with regards to improved health. If you would like to learn more about the Community Corporation of Santa Monica and the services they provide please visit their website at http://www.communitycorp.org. To purchase marketing materials for their S.M.A.R.T. (Students learning about stroke, Making healthy lifestyle choices, Aware of Risk factors, and Teaching others strokes are 80% preventable) program. S.M.A.R.T. is a stroke awareness program for school aged children to learn the signs and symptoms of a stroke. They deliver research based intervention programing addressing the serious health problems that are associated with childhood obesity, which also improves adult stroke literacy through education of their children. If you would like to learn more about the RTH Stroke Foundation and the services they provide please visit their website at http://rthfoundation.org.